(RRP £279.99). A very elegant suede leather midi pencil skirt in luxury soft pale tan suede, perfect for smart wear, with a long back split/vent for added style and easier movement. It is a below knee midi length (around 26in), finely tailored to be close-fitting, sitting on the waist and following the curvature of the body to flatter your figure. Fully lined. By Ashwood. 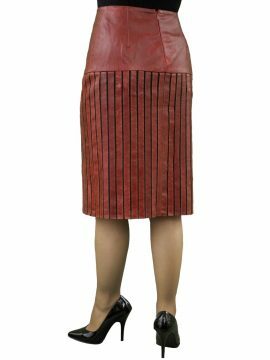 A very elegant and exquisitely tailored pencil skirt by Ashwood in beautifully soft suede leather – ideal for many different occasions for smart wear or even less formal. It is designed to be close-fitting with a rear split/vent for added style and allowing extra room for movement. Close-fitting style with a slim/snug fit – designed to sit on waist. This same style is also available with a zip in place of the rear split in either the same length or knee-length.